TORONTO, August 9, 2017 – Underscoring its role as a leader in Print MIS solutions, Avanti Computer Systems Limited today announced that its flagship Avanti Slingshot® solution has won two prestigious MUST SEE ‘EMS awards conferred in conjunction with PRINT 17, the printing industry’s largest North American trade show. The awards recognize forward-thinking suppliers and manufacturers who are providing the most cutting-edge products and technologies. 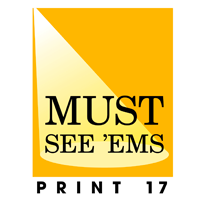 Avanti Slingshot has won a total six MUST SEE ‘EMS since its introduction four years ago, at PRINT 13. Avanti Slingshot’s new Scheduling Reservation System, which captured a MUST SEE ‘EMS award, provides an enhanced level of flexibility for print and marketing services providers. Using the system, they are able to reserve press time before receiving a confirmed sales order. By committing to a precise delivery date early in the process, sales representatives can enhance the chance that their proposal will convert to a hard order. Once the order is received, the reserved press time automatically changes to paid job status without losing its place on the shop’s master schedule. Having the required substrates and other consumables at the ready is critical to staying on schedule. The new Avanti Slingshot Wireless Warehouse Management System, which also won a 2017 MUST SEE ‘EMS award, streamlines the process without being tethered to a workstation. With Avanti’s mobile application installed on a device with a built-in bar code scanner, employees can quickly and accurately track all aspects of the physical inventory and integrate that data with purchasing, scheduling and other functions across the operation. Avanti partner, MarcomCentral, also has won a MUST SEE ‘EMS award for their JobDirect® Plus solution highlighting its seamless integration with Avanti Slingshot. Visitors to PRINT 17 (Chicago, September 10-14) can see Avanti Slingshot – including the new modules – at the Avanti booth #635. Additionally, Avanti is hosting a free webinar on September 7th featuring a virtual “sneak peek” at the new release of Avanti Slingshot. Register here.